First Lieutenant Benjamin E. Schiff was born in Nephi, UT and grew up in Detroit, MI. In 2008, he enlisted in the United States Army as a 36B, Financial Management Specialist. In 2014, he commissioned as an Air Defense Artillery Officer through the United States Military Academy at West Point. 1LT(P) Schiff’s first assignment beginning his Army officer career was as a Launcher Platoon Leader for Bravo Battery, 5-7 ADA, 10th AAMDC in Kaiserslautern, Germany. Later he was assigned as the Fire Control Platoon Leader for Bravo Battery. In 2016, 1LT(P) Schiff moved to HHB, 5-7 ADA in Baumholder, Germany as a Tactical Director. He is currently serving as the Fire Direction Center Officer in Charge for 5-7 ADA. 1LT(P) Schiff’s awards and decorations include the Army Commendation Medal (2), Army Achievement Medal (2), National Defense Service Medal, Global War on Terrorism Service Medal, Military Outstanding Volunteer Service Medal, Army Service Ribbon, Holland Four Day Event Medal (2), and the Israeli Air Defense Officers Badge (Gold). 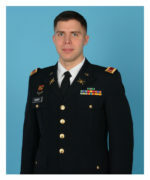 1LT(P) Schiff holds a bachelor’s degree in Psychology from the United States Military Academy, His military education includes Patriot Top Gun, Multi-Tactical Data Link Advanced Joint Interoperability Course, NATO Ground Based Air Defense Tactical Evaluation Course, United States Army Combative Level 1 and 2, and the Air Defense Artillery Officer’s Basic Course. He is married to Stephanie Schiff of Warren, MI.